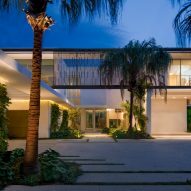 South African firm SAOTA has built its first project in Miami Beach: an expansive, waterfront home that boasts a basketball court and a waterslide. Called Pine Tree House, the family residence is located in the historic Collins Waterfront district. It occupies a long, linear site that stretches between a busy road and an active canal. Composed of rectilinear volumes and floating planes, the two-storey home is meant to feel expansive and fluid, while also conveying a sense of containment. The residence marks the first completed project in Miami for SAOTA, a South African firm known for creating sleek, modern homes with a focus on indoor-outdoor living – like a mountainside villa that frames views of Cape Town's dramatic scenery. 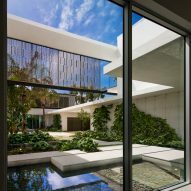 For the Florida dwelling, the firm stayed true to its ethos, creating a "porous" home that embraces the landscape and the sky. "Captivated by the Miami climate and landscape potential, the design embodies these principles – creating a landscape of experiences," the studio said. Rather than containing everything within a single, distinct building, the team spread the program across the elongated site. Inside the home, the ground level contains a kitchen, dining area, great room and loggia. Upstairs, the architects placed a family room, three bedrooms and the master suite. A rooftop terrace offers views of the palm-tree lined canal. A variety of outdoor spaces are dispersed throughout the property. "Through the introduction of a collection of introverted and extroverted courtyards, all aspects of the program have an immediate relationship to the outdoors," the studio said. 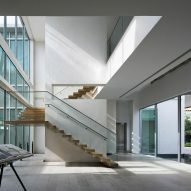 Floor-to-ceiling glazing and retractable walls further enhance the connection between inside and out. The home is fronted by a basketball court, which serves as a buffer between the residence and the active street. It also provides a "suspensive arrival experience as the user enters into the grand, serene forecourt". A pool terrace was placed in the rear of the property, which faces the canal. To animate the area, the team added a hot tub, a barbecue area and a bar, along with large waterslide. 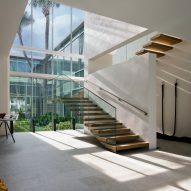 The slide descends down from a terrace on the second level, and can also be accessed via a stairway that leads up from the pool deck. Parts of the home are sheathed in perforated, anodised aluminium screens, which provide privacy and mitigate solar heat gain. The patterning in the brise-soleil was created using a computer numerical controlled (CNC) machine. "The screens play with the character of light, heightening the experience of enclosure and transparency," said SAOTA. 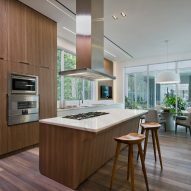 An "assertive but restrained" palette of materials, including various types of wood, was used throughout the residence. "This ensured a cohesion both between spaces, but also the internal and external connections," the architects said. The lush landscaping was conceived by Raymond Jungles, a local designer who has worked on projects such as the Grove at Grand Bay, the twisting condo towers designed by Bjarke Ingels Group. 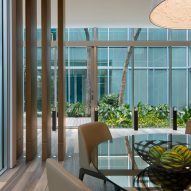 "Working with Raymond Jungles was an excellent experience for SAOTA, as his relaxed, confident and freehand approach to landscaping resulted in a natural environment that truly reflects Miami," the architects said. 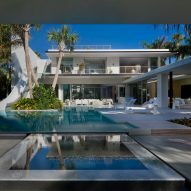 Florida's tropical climate lends itself favourably to outdoor living. 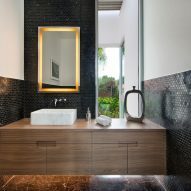 Other homes in the state that embrace this include a residence by Studio MK27 with its own private lagoon, and a modernism-influenced villa designed by a filmmaker. Photography is by Dan Forer.